Sponsored by the U.S. Department of Labor’s Office of Disability Employment Policy (ODEP), Add Us In (AUI) is a Disability-Inclusive, Diversity smALL Business Initiative. It is designed to identify and develop strategies to increase employment opportunities within the small business community for individuals with disabilities, especially from historically-excluded communities. Included within the small business community are targeted businesses that are owned and operated by people of color; economically disadvantaged; lesbian, gay, bisexual, and transgender individuals; women, veterans, and people with disabilities. One of the high-priority goals of AUI is to create business engagement models that can be replicated on a national scale. Related to this goal is the companion goal of building national and local networks of experts skilled in connecting small employers with the underutilized talent pool that is people with disabilities. The employment internship model designed, implemented, and evaluated by the California Consortium (more about the Consortium below) produced the first of its kind findings that will significantly add to the existing body of knowledge for employing people with disabilities. Read about these revealing findings in the “California Consortium Disability Inclusive-Diversity smALL Business Initiative Reflections with Case Illustrations of Success and Challenges” and “Effective Engagement with the Business Community,” which are both in PDF format below. WID serves as Consortium program director, research analyst, fiscal agent, and disability-serving organization. Members of the consortium include: National Gay & Lesbian Chamber of Commerce (NGLCC), business outreach ambassador and gateway to diverse chambers of commerce and minority-owned businesses, representing interests of more than 1.4 million LGBT-owned U.S. businesses; California Department of Rehabilitation (DOR), workforce partner assisting eligible Californians with disabilities to obtain and retain employment; and the California Foundation for Independent Living Center’s Youth Organizing Disabled and Proud Program, the youth serving organization. Our model develops, implements, and evaluates a program that engages national, minority-focused small business associations with peer-to-peer presentations, discussions, and education to better understand rationale and process for hiring youth and veterans with disabilities; links employers, recent graduates, and college students with disabilities to create employment opportunities; adapts and expands the initiative to a model embraced and sponsored by the small and minority-owned business community. 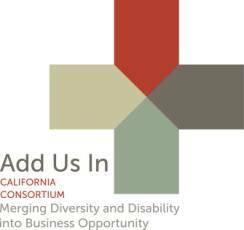 The California Consortium’s focus is on companies based in California with employees from 2 to 100 made up of diverse owners who are interested in sponsoring an intern with a disability. Preparation of this item was funded by the Office of Disability Employment Policy, U. S. Department of Labor, Grant Number: OD-22554-11-75-4-6. This document does not necessarily reflect the views or policies of the Office of Disability Employment Policy, U. S. Department of Labor; furthermore, the mention of trade names, commercial products, or organizations does not imply endorsement by the U.S. government. For more information about AUI, contact Loretta Herrington, the Project Director, at loretta@wid.org. I’m Andrew. 42 years. I suffered SCI from a car accident. It is with great heartfelt appreciation that I’m requesting for you to support me in my disabled painful life. If I can get a scooter or power wheelchair it will improve my life and health. I have a massive bedsore. Thank you for reaching out to WID and sharing your story, Anyinbemah Andrew. Unfortunately, we are not a funding organization, and we do not offer grants or donations. We suggest you reach out to disability-focused organizations in your area to learn about local funding opportunities or search the Internet for foundations that share your mission.